"Professional Supervised Child Visitations & Exchanges Made Affordable and Easy"
Our mission is to provide easy, stress-free, and affordable child visitations to families in Southern California. We are professionally trained child visitation monitors that provide safe and enjoyable off-site environments for parents and children to reunite. 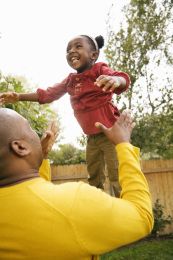 We are passionate about the welfare and safety of children and we believe it is important for every parent and child to stay connected as the child reaches adulthood. Our monitors serve as a neutral third party who observes the interactions between the parent and child in order to ensure a safe visit for the child. We service families with court ordered supervised visitations in the Los Angeles and Orange County areas. The service areas include Los Angeles, Hollywood, Beverly Hills, Torrance, Long Beach, Pasadena, Anaheim, Irvine, Huntington Beach, and many more! Call us now to schedule an intake interview with one of our professional monitors today! What is a Supervised Visitation? Supervised visitation is the contact between the non-custodial parent with one or more children in the presence of a a neutral third party. The monitor does not determine the circumstances surrounding the court ordered custody or visitation of the child, but rather monitors, observes, and records the actions and activities of the child's visit with the non-custodial parent. What is a Supervised Exchange? Supervised exchange is a monitored transfer of a child from the custodial parent to the non-custodial parent in the presence of a neutral third party. The supervision is limited to the 'exchange only' for non-supervised visitations. Our monitors simply monitor and record the events and activities of the exchange. As a supervised visitation service provider, EZ Supervised Visitations maintains a strict confidentiality agreement with our clients. We will maintain a neutral role by refusing to discuss the merits of the case, or agree with or support one party over another. Any discussion between a monitor and the parties will be for the purposes of arranging visitation and providing safety of the children during the visit.